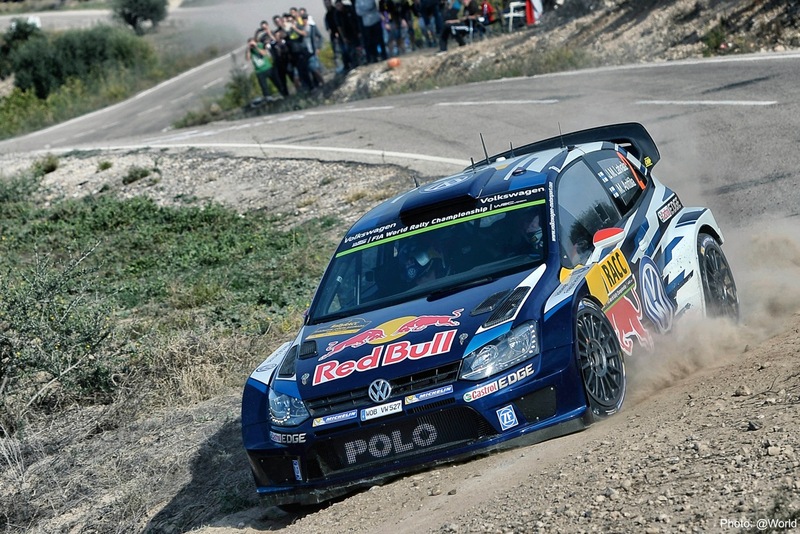 Maiden WRC victory for Andreas Mikkelsen in Rally Spain, Jari-Matti and Miikka finish second! Home / WRC / Spain / Maiden WRC victory for Andreas Mikkelsen in Rally Spain, Jari-Matti and Miikka finish second! Wolfsburg (25 October 2015). A superlative victory: Andreas Mikkelsen and Ola Fløene have won the Rally Spain with Volkswagen to claim their first victory in the FIA World Rally Championship (WRC). 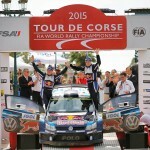 Their first WRC success completed a remarkable one-two for Volkswagen – the seventh of the season. The Norwegians clinched victory in the dying seconds on the closing Power Stage. Mikkelsen/Fløene won the final stage to finish 3.1 seconds ahead of their team-mates Jari-Matti Latvala/Miikka Anttila (FIN/FIN), before benefitting from a mistake by fellow Volkswagen men Sébastien Ogier/Julien Ingrassia (F/F), who retired. After twelve podiums with the Polo R WRC, Mikkelsen and Fløene climbed onto the very top step of the rostrum for the first time in their career – on their 64th appearance at the pinnacle of rallying. This was victory number 11 of the season for the Polo R WRC, and the 33rd since the car made its debut in January 2013. In securing a Volkswagen one-two, the Polo R WRC was the most versatile and fastest World Rally Car at the only rally on the World Championship calendar to be held on both gravel and asphalt: 17 of 23 possible stage wins went to Wolfsburg, including a clean-sweep on asphalt. One thing is certain going into the final round of the World Rally Championship, the Rally Great Britain: the three Volkswagen duos will finish first, second and third in the Drivers’ and Co-Drivers’ Championships for the second year in a row. A rally duel, mano a mano, right through to the finish: the battle between Andreas Mikkelsen and Jari-Matti Latvala was decided by just 3.1 seconds – in favour of the youngster. A puncture cost Latvala roughly ten seconds on the 20th of the 23 special stages. Just one stage later, Mikkelsen dropped several seconds after spinning his car. Going into the closing Power Stage, the experienced Finn trailed the young Norwegian by just 1.4 seconds. It was left to the Power Stage to solve this thriller. Before the battle with Mikkelsen developed into such a thriller, a captivating struggle for the lead had lit up the Rally Spain: a flat tyre on the twelfth of 23 special stages brought the duel between Sébastien Ogier and Jari-Matti Latvala to a premature end. Latvala suffered a puncture whilst cutting a right-hander, losing almost a minute as a result. However, Latvala bounced straight back from this set-back: he battled his way back into second place, where he found himself embroiled in another all-Volkswagen duel – this time with team-mate Andreas Mikkelsen. 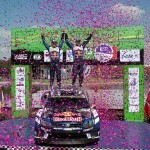 Meanwhile, Ogier/Ingrassia appeared to have wrapped up their eighth win of the season. However, a single mistake made whilst attempting to secure Power Stage victory number 26 dashed any hopes of claiming the 32nd victory of their career shortly before the end of the rally. On the final stage, which was reminiscent of a racetrack, the three-time world champions strayed from the racing line and touched a crash barrier, causing such severe damage to their car that they were forced to retire. The pair was given the all clear following a routine medical check. One day on gravel, two on perfect asphalt – it is this mixture that makes the Rally Spain a unique event in the FIA World Rally Championship (WRC). And the Polo R WRC is not only unbeaten at this challenging rally, but has now achieved multiple success for three years in a row. Following the one-twos in 2013 and 2014, the top two steps on the podium were again occupied by crews in the World Rally Car from Wolfsburg in 2015. The Rally Spain had a special feature in store for the mechanics: from Friday to Saturday, they had to convert the World Rally Cars from their gravel trim to an all-out asphalt set-up – and in a limited amount of time: the technicians were given a maximum 75 minutes. The longest service of the season saw the Volkswagen mechanics replace 4,044 individual components, some pre-assembled, on the three Polo R WRCs. These included: the complete chassis geometry, 18-inch wheels instead of the 15 inches usually used on gravel – including brake discs with a larger diameter, as well as the damper/shock units, gearbox and pedals. Reigning champions Sébastien Ogier/Julien Ingrassia have defended their titles, Jari-Matti Latvala/Miikka Anttila are second in the World Championship, with Andreas Mikkelsen/Ola Fløene third overall – Volkswagen is assured of ending the season in the top three positions in the Drivers’ and Co-Drivers’ Championship. Ogier/Ingrassia wrapped up a successful title defence at the Rally Australia, while the result in Spain means Latvala/Anttila tightened their grip on second place – as did Mikkelsen/Fløene on third place. Podiums number 23 and 24 meant more than just the 33rd victory for the Polo R WRC on its 38th outing, and the 65th podium finish since the World Rally Car made its WRC debut in January 2013. It also meant the successful car set a new personal record: in 2014, its most successful season prior to this, the Polo R WRC claimed 23 podiums. The closing Power Stage went to the Volkswagen duo of Mikkelsen/ Fløene for the first time this season, and the second time ever. They completed the twelve kilometres just 1.7 seconds faster than their rivals from the Volkswagen team Latvala/Anttila, who picked up two extra points. As such, the battle to finish runner-up in the Drivers’ and Co-Drivers’ Championship will be decided at the Great Britain. Mikkelsen/Fløene in third place trail Latvala/Anttila in second by just 26 points. A maximum 28 points are on offer for winning both the final rally and the Power Stage.